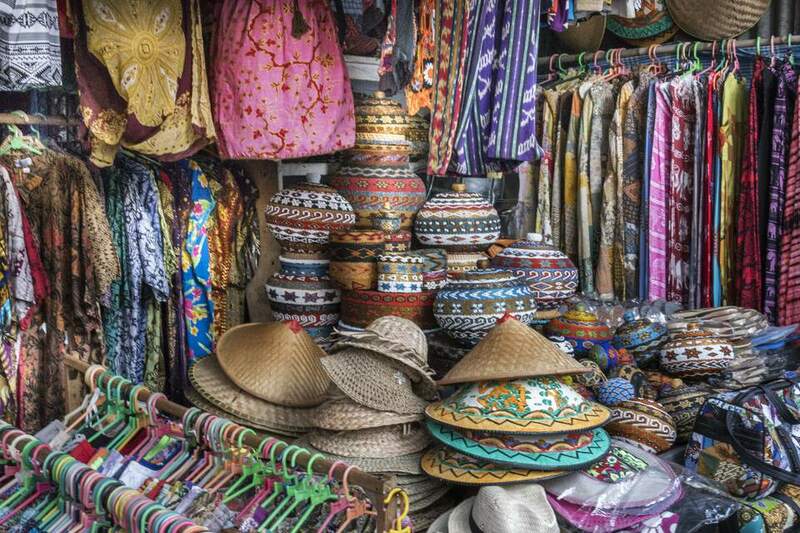 Looking through Bali’s discount outlets and specialty stores can be a strange way to experience the island, but you can look at Bali’s shopping output as a different expression of the island’s culture and natural gifts. Generations of artisans, who used to cater only to the priests and nobles of Bali, now churn out a wealth of tastefully crafted items for the tourists who romp through the island: both international tourists winding up an Indonesia-wide itinerary, and Indonesians looking for traditional “oleh-oleh”, or souvenir items to take home to loved ones. The items on sale at the places listed here can be quite well-made – the Balinese artisans know how to respond to an international market. Some of these stores offer everything but the kitchen sink, while others specialize in a particular type of merchandise. Many also offer international shipping if you ask. Look through the places listed below and warm up your credit card – happy hunting! The Joger outlet on Jalan Raya Kuta is famous among Indonesian tourists in Bali for the clever wordplay on the merchandise and throughout the store. Of course, it all flies over your head if you don't understand the subtleties of Bahasa Indonesia, but Joger has plenty of fun stuff even for non-Indonesians: cups shaped like breasts and clocks with hands that move counterclockwise, among others. The store also stocks a good number of Balinese handicrafts and other souvenirs, but the T-shirts are the store's biggest draw. This Bali ceramics atelier is big with pottery fanatics - their modern, tasteful designs grace five-star restaurants and hotels on the island and as far away as Sydney and New York. If you want one of their plates on your dinner table, visit their showroom in Jimbaran - a temperature-controlled art-deco space that showcases Jenggala's output and allows you to get a feel for the merchandise. Jenggala allows you to experience their handiwork in other ways, too: you can peek into the viewing area to see their skillful artisans at work, or even sign your kids up for their "Paint-a-Pot" and "Make-a-Pot" classes: two- and four-hour sessions where you can throw your own tentative pottery, or paint your design onto a Jenggala Ceramic of your own. This four-floor warehouse outlet north of Kuta in South Bali hawks a tidal wave of Balinese handicrafts, perfect for bulk purchases of Bali souvenirs or items for home use. Pillow covers, tablecloths, toys, carvings, all rather higgledy-piggledy arranged throughout the space. The disorganized look of the shop interior means you'll need a greater effort to pick through the dross to find the stuff you really want. Prices are fixed, but very low - you'll pay about 40% off compared to similar items in Bali department stores like Matahari or Centro. Credit cards accepted - but be warned, it's common practice to tack on about 3 percent of the price for credit card purchases. Krisna specializes in clothes (it has a branch network that stretches throughout Indonesia) but its Bali outlets have branched out into souvenirs too, with a wide selection of Balinese hand-crafted items sold at low, fixed prices. The cavernous interior is air-conditioned and also comes with a food court, in case your shopping spree is taking overly long. Apart from the main branch along Jalan Nusa Indah in Denpasar, the Krisna network extends to three other stores in Bali. This chain of souvenir stores operates throughout Denpasar and Tuban in South Bali. The two Denpasar branches are sizeable and offer sarongs, batik, artwork, bags, wallets, bangles, and toys at fixed (but low) prices. Address: Jalan Nusa Kambangan No.28 B, Denpasar, Bali (Erlangga 1, location on Google Maps); Jalan Nusa Kambangan No.162, Denpasar (Erlangga 2, location on Google Maps).